There are some jobs that people expect you to keep for life. Pope. US Supreme Court Justice. Principal Trumpet of the Chicago Symphony. 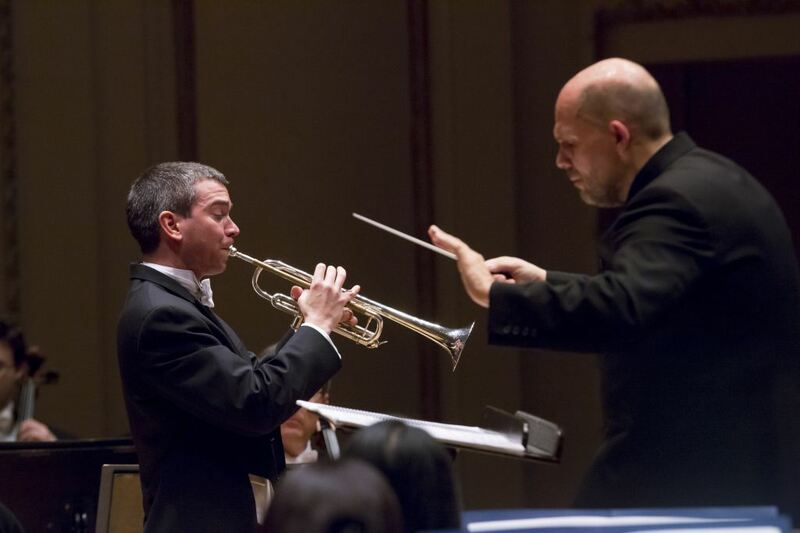 But I guess if a Pope can quit early, we shouldn’t be shocked that the CSO’s first chair trumpet can do it too. Chris Martin — the trumpeter, not the lead singer of Coldplay — caused a stir last year when he announced that he’d be taking a leave of absence from the CSO to become Principal Trumpet of the New York Philharmonic, at least temporarily. Chicago’s brass section has been the standard-bearer of the entire orchestra for decades, a towering symbol of what many people think orchestral brass sections should be. The unquestioned leader of the section for more 50 years was Adolph “Bud” Herseth, the paragon of the modern American trumpeter. The well-regarded Mr. Martin was widely considered to be a worthy successor of that role. The CSO has been losing first chair musicians at an alarming rate over the past few years, but the prospect of Bud Herseth’s chair going empty once again was a different matter entirely. Still, Chicago fans have held out hope that this was just something that Mr. Martin needed to get out of his system. That hope is now officially gone. Earlier today, the Chicago Symphony officially announced that Mr. Martin has resigned as the orchestra’s Adolph Herseth Principal Trumpet. The move was effective as of yesterday. According to more than a few unconfirmed reports, Mr. Martin was not only offered the job with the NY Phil, we was also offered tenure immediately instead of having to go through the usual one- to two-year process. That is almost unheard of, especially for a position of that stature in an orchestra of that prominence. The prior holder of NY Phil’s Principal Trumpet, Phil Smith, was not only a legend in his own right but he too came to the NY Phil directly from the Chicago Symphony. For those keeping score, the CSO is still in search for a Principal French Horn to replace the retired Dale Clevenger. Mr. Martin had been Principal Trumpet of the CSO for eleven years. Prior to that, he held the same job with the Atlanta Symphony from 2000 to 2005, and was Associate Principal of the Philadelphia Orchestra for three years before that. During his first year in Atlanta, Mr. Martin was offered the Principal Trumpet chair of the Los Angeles Philharmonic, a position that had opened up with the retirement of yet another legendary trumpeter, Thomas Stevens. He turned it down.The Atlanta Journal-Constitution later asked the Georgia native why he decided to stay in Atlanta instead of taking the higher paying (and arguably more prestigious) position in LA:”Actually, it was a combination of things,” explains Martin. “I had just gotten here. The orchestra was moving in a really positive direction. We had just hired a new principal trombone [Colin Williams ] who everybody liked; the new hall was looking good; [Conductor Robert] Spano was looking good. Plus, I grew up with this orchestra. Having seen where it had come from and where it could go, I wanted to be a part of that.” (Susan Elliott: “ASO’s top trumpeter taking solo bow,” The Atlanta Journal-Constitution; September 11, 2003).Not long afterwards, the LA Phil decided to promote Donald Green, who at the time still the orchestra’s Associate Principal Trumpet, to first chair. Tags: Chicago Symphony, Chris Martin (trumpet), Christopher Martin (trumpet), New York Philharmonic. Bookmark the permalink.